There are now around nineteen large-scale projects now either operational or under construction patterns have begun to emerge that indicate which factors make for a successful project [i]. Use of captured CO2 for Enhanced Oil Recovery (EOR) is common across projects of various types, being a feature of two thirds of projects. When injected into oil reservoirs each tonne of CO2 can enable the production of (typically) two or three additional barrels of oil, making the CO2 a valuable commodity rather than a waste product. While the carbon capture project is unlikely to be able to capture all of this value (much of it flowing to the owner of the oil field), the revenue can be substantial. For example, the price paid for CO2 in some Canadian projects is understood to be $60/tonne or more. This greatly enhances the economics of a project providing a revenue stream rather than incurring a cost for transport and storage, which in the absence of oil revenue is likely to be at least $20/tonne. The most widespread application of CCS technology to date, with nine projects out of the ningteen and over 60% of annual volume captured, has been for natural gas processing, where CO2 needs to be removed to meet the specifications required by the pipeline network. There is a wide range of projects, including onshore processing where the CO2 is used for EOR, such as at the Val Verde project in the USA, offshore processing where CO2 is injected into saline formations, for example the Sleipner and Snohvit projects in the Norwegian North Sea, and the Gorgon project under construction in Australia, where CO2 will be captured from a LNG liquefaction facility. There are other projects where a relatively pure stream of CO2 is produced as part of an industrial process, avoiding much of the capture costs associated with dilute CO2 streams. These include capture from electric arc furnaces at steel mills, such as at the ESI project in Abu Dhabi, and capture from steam methane reformers (SMRs), such as an Air Products plant that has just begun operating in Texas. Other industrial projects include Shell’s Quest oil upgrader in Alberta and the Enid fertiliser plant in Oklahoma. With substantial natural gas processing facilities, industrial facilities and onshore oil fields suitable for EOR, North America has been the main location for all types of CCS projects to date, around two thirds being in Canada or the USA. However the contribution of CCS to decarbonising the power sector and other combustion remains minimal. There are only two full-scale (greater than 100MW capacity) power projects under construction. The largest of these, the Kemper County project in Mississippi, has relatively high emissions (estimated to be greater than those of a CCGT per MWh) due to its use of lignite and a relatively low capture rate. The other is the Boundary Dam project in Saskatchewan where construction is nearing completion and commissioning. Both are due to start this year, although Kemper may slip into 2015. Whichever of the CCS technologies a power project uses – pre-combustion, post-combustion or oxyfuel – a chemicals plant needs to be added to the power plant, and this is inevitably expensive. The large additional capital and operating expenditures required for a capture system, combined with the loss of efficiency due to the energy required to run the capture process, including the electricity required to compress the CO2 ready for transport, add greatly to the cost of power. According to a recent study sponsored by the UK government, power generation with CCS has a cost of around £161/MWh at present, about three times the cost of power from conventional fossil fuels [ii]. The study suggests that this could potentially be reduced to around £100/MWh by the early 2020s, although this may prove a somewhat optimistic estimate. Meanwhile, the Kemper County plant has reportedly suffering cost over-runs of around $1 billion, raising the cost to around $4.75 billion (including pipe and mine), a substantial cost for a project of less than 600MW ($8000/kW). The large additional cost of power from CCS means that it needs types and levels of enabling support similar to other early stage power generation technologies. The power sector projects that are under construction both have favourable financial arrangements. The Boundary Dam project is being developed by the province-owned utility, Saskpower. This means that the additional costs of CCS can be covered through government-backed financing and through the ability to pass on costs to electricity users. The Kemper County project is allowed to recover its costs from the local rate base from the start of construction, greatly improving the financial attractiveness of the project. Both projects also benefit from sales of CO2 for EOR. Financial support is likely to take the form of some combination of a premium price for the power, capital grants, loan guarantees and other source of low cost capital, and perhaps support for provision of common infrastructure, including pipelines and sinks. A substantial per MW or per MWh contribution is needed, and the relatively large scale of CCS projects means that finance needs to come in large blocks, with large amounts of support for each project. Building projects will be necessary to enable “learning by doing” to bring the cost down substantially, but learning times are long due to long design and construction periods. So far putting the necessary support in place has proved daunting for most governments, and public opposition has also hampered progress in some jurisdictions. Europe has made little progress, and in the USA the potential to reduce emissions much more cheaply by switching from gas to coal seems likely to lead to limited prospects for CCS power projects in the short to medium term. However there is increasing interest in CCS in China, and it is possible that, as with so much else, development in China will prove crucial to the global picture over time. The strength of interest in CCS may in turn depend on progress with developing shale gas in China. Achieving scale sufficient to capture a large proportion of the world’s combustion emissions from the power sector or elsewhere will in any case be an enormous task. CO2 is 27% carbon. Fossil fuels are more typically 75-80% carbon [iii] by mass. From this, a simple mass balance implies that the capture, transport and storage to dispose of the CO2 must handle about three times the mass of the production and transport of the fossil fuels burnt. Many new CCS projects are likely to continue to be outside the power sector, especially where there is potential for EOR, and this will make important contributions, for example to knowledge of reservoir management and in some cases to the scale of pipeline networks. It remains important that some power sector projects are undertaken at scale, as implementing widespread CCS on power plants, especially on gas, remains an option that will probably need to be exercised in the coming decades. 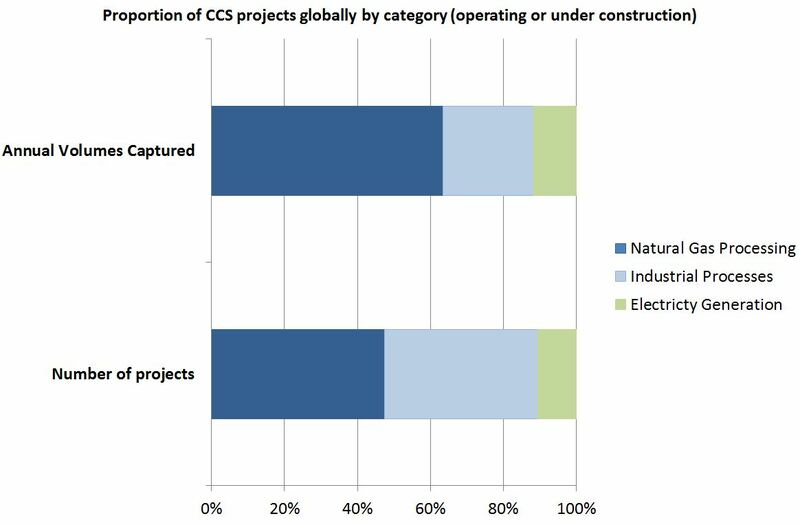 However realising power projects with CCS will continue to be a difficult and, very likely, slow process. [i] See the 2013 Annual Report from the GCCSI. The In Salah project is excluded as injection is reported as suspended. [iii] This is a typical number. Natural gas has a carbon content about this level. The carbon content of oil is higher, coal varies depending on quality. The essential point that the waste disposal must handle much greater mass than the fuel supply remains unaffected.